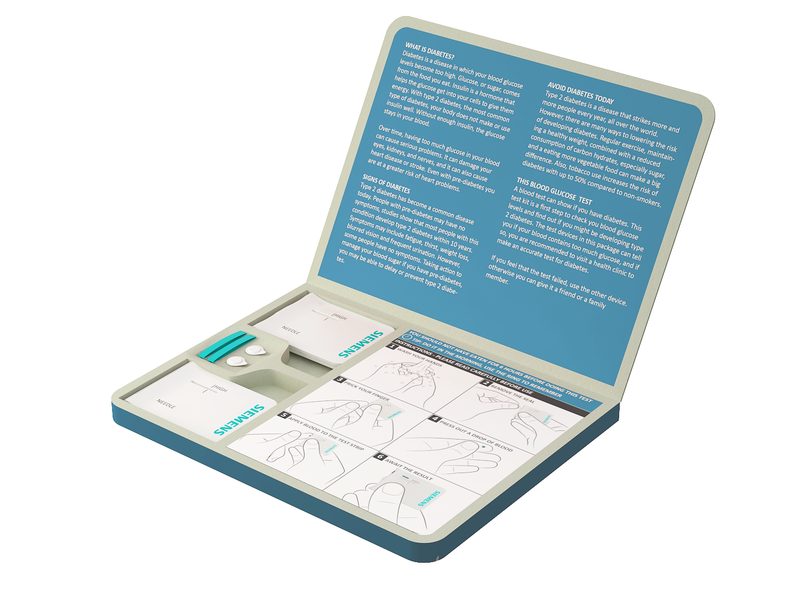 This is a single use kit to diagnose early diabetes. We won Siemens Innovation award and get a chance to become part of a multidisciplinary team in Germany for summer workshop. 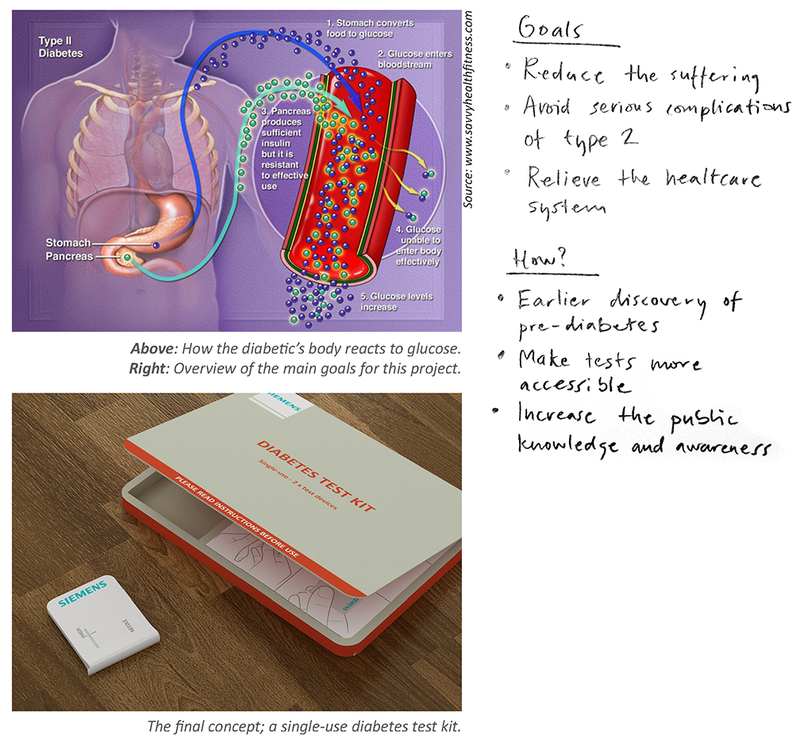 Brief: Siemens healthcare started a competition seeking ideas for future of healthcare, so we decided to focus on the problem of undiagnosed diabetes. Challenges: Our major problem was a very wide brief, we needed to boil it down to a point where we can focus and create a solution. We have decided to focus on diabetes because I was just diagnossed. We have spent an extensive time on talking and researching on newly diagnosed diabetes patients (including me) and doctors to find out why it is hard to do an early diagnose. When we have identified the problem we wanted to cover our solution not only with a physical product but how the whole implementation ecosystem will work. After testing various clay and paper models we have realized that a slight wedge on the needle side gave big confidence and control to the user. Since it is important to remember use the test first thing in the morning we have decided to add a little ring reminders that you put on your finger overnight. An estimated 4-5% of the Swedish population has diabetes type 2 without knowing it. Complications from late discovery put great pressure on both the patent and the healthcare system, as they are expensive to treat and a painful experience for the patent. An early discovery of type 2 diabetes makes it possible to prevent difficult complications, and in some cases even revert it, by making healthy changes in your lifestyle. Despite this, in everyday life, there are few ways to check yourself for diabetes. To do this you must visit a health clinic to have a blood glucose test, and few people do this regularly. We strongly believe that it should be easier to check your blood glucose levels regularly, and the public awareness of type 2 diabetes should be increased to avoid the increasing amount of diabetics in the world. Our solution is a simple, single-use diabetes test, which is delivered in a package including basic facts about diabetes. This test kit is designed to be easy to produce to a low cost. Our vision is that this test kit is distributed for free to the public, targeting people that are in the ages from 25-65 years. This way we could identify a great amount of undiagnosed diabetics and help them change their lifestyle before it becomes overwhelming and painful. 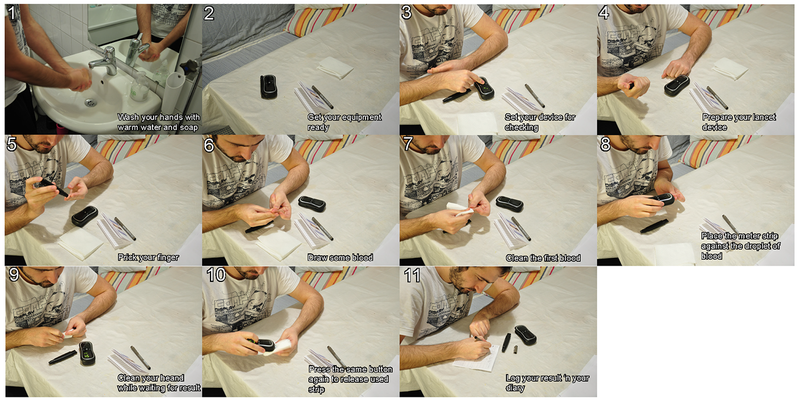 Testing your blood glucose levels requires a blood glucose meter. There are many different products on the market and most of them are electrical. They are usually given for free to diagnosed diabetics by the healthcare system. These devices are primarily designed for home-use and involve a fairly simple procedure to make regular checks. 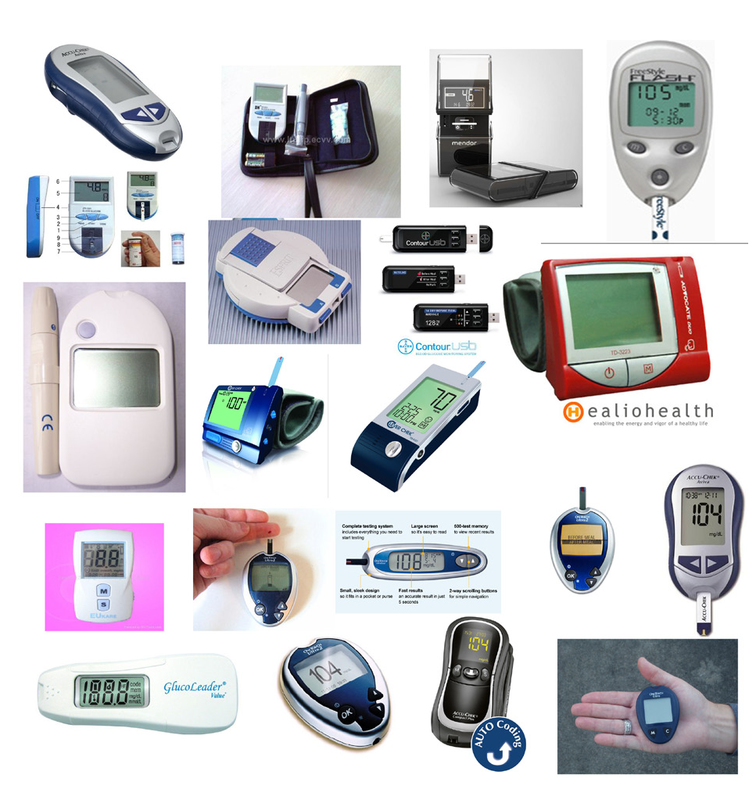 Apart from the essential ones, additional functions are often included to make it easy for the everyday use, such as a log function to keep track of your levels over time, many of these test devices are well designed, especially the newer models that solves different issues of everyday use. Even the more anxious persons, afraid of needles, blood etc., might be surprised of how little effort is needed to make a test. In our research, we were surprised to find no products designed for one-time use only. So, unless you have a friend or family member that has diabetes and a test device, you won’t have frequent opportunities to do the test. Still, we’ve thought, just as single-use pregnancy tests exist, the individual should be able to do a test at home, in peace and comfort. As the procedure is uncomplicated and quick, with the help of some instructions it should be easy to do it properly, without the help of a professional. A blood glucose test at the clinic is most commonly performed when you haven’t eaten for at least six hours, which makes it convenient to do it when you wake up in the morning. Our goal is to make a major impact on the public health, and our main priority has been to increase the awareness of diabetes. Compared to the amount of diabetics that we have today, there is very little knowledge about the disease among the people, and too few know how an unhealthy lifestyle affects the functions of your body. We mainly want to reach the large group of people that rarely goes for health check-ups, the unaware, undiagnosed diabetics, people that maybe say that they feel fine in general, not taking actual symptoms seriously or don’t think that they are noteworthy. They are in the ages of 25-65 years, and are found at different workplaces, and in the city. We aim at people with a lifestyle with enough abundance to enjoy life, but not always caring enough about their health. They might not have much experience with diabetes or other chronical diseases, and they are not likely to visit a health clinic unless they are badly ill. Some of them are pre-diabetics and will discover their disease within a couple of years, and it is important that this hap-pens as soon as possible. Reaching out to the people in this target group requires a major distribution process. Just as with regular blood glucose meters, this product should be offered by the public healthcare for free. 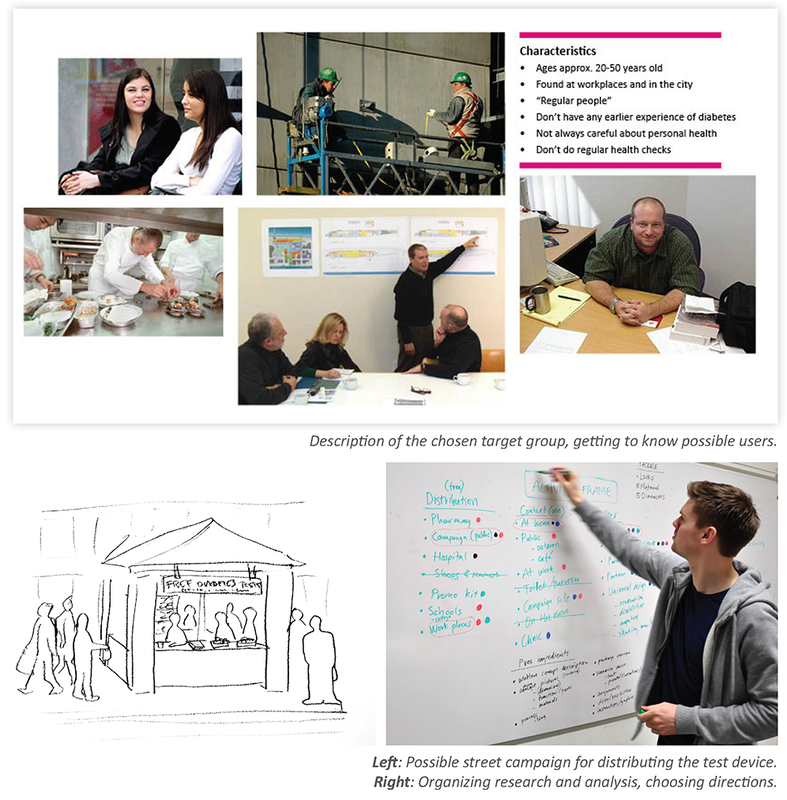 Possible places for providing the devices include schools, workplaces and in the city. The decision to focus on the largest target group of undiagnosed diabetics, lead us to mainly focusing our product on type 2 detection. Type 1 is most commonly diagnosed in young childhood, and is seldom developed after your 20s. The heavy symptoms that type 1 patients are troubled with also makes it obvious that their body is not functioning properly. Apart from blood tests, a so-called ketone test can also help to determine if you have a high blood sugar. By measuring the amount of ketone in the urine you can tell if the body has an excess of glucose. However, this method is mainly accurate for testing type 1 diabetics, or patients with later stages of type 2. For this reason, as well as other benefits that we identified, we have chosen to work with blood for measuring the glucose levels. In particular, a blood glucose test is the most efficient test for detecting the early stages of type 2. 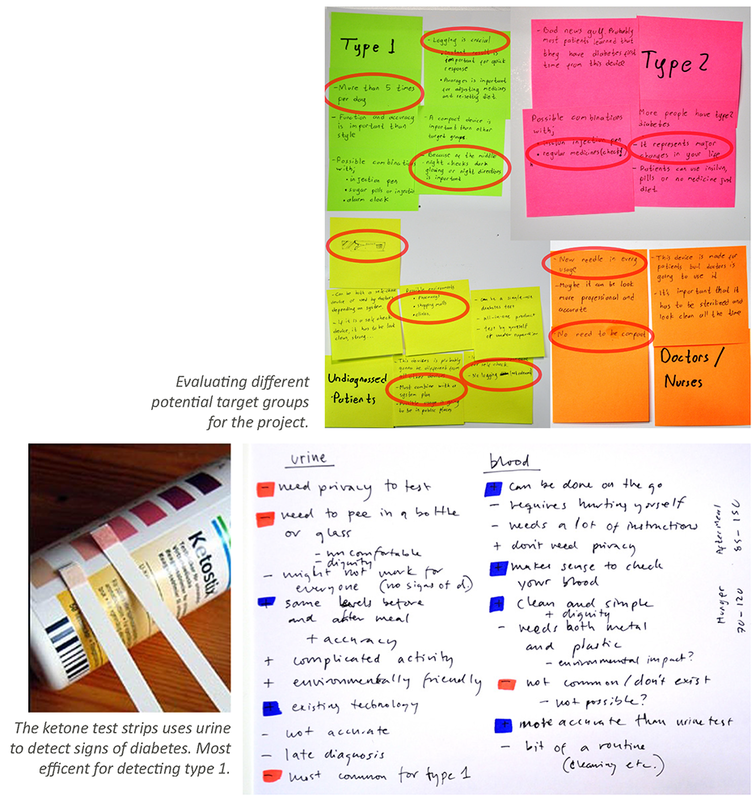 Since we have found no products for single-use, we have not identified a specific solution for testing blood glucose in a very simple device such as ours. Keeping it simple, in this case, means avoiding electric components, and all blood glucose meters that we have found are electric. Despite this, we expect that it can be developed if there was a great demand for it. Our aim is to reach out to as many as possible with this product. 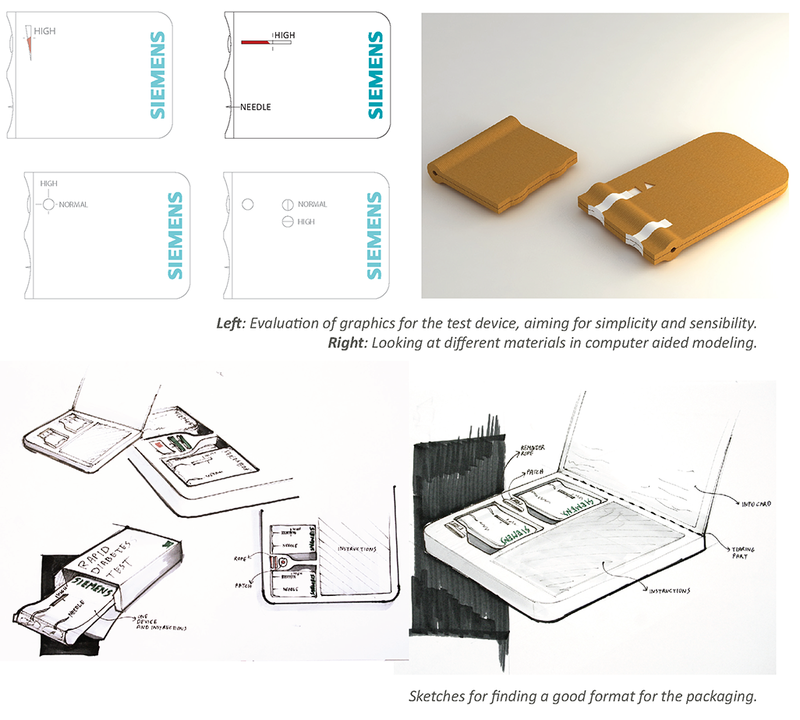 For that reason one of our goals was to create a low-cost design, simple to manufacture, with conventional materials. All in all, our keywords were small, simple and lightweight, however, not at the expense for the user experience. People have to trust this product and feel comfortable to hold it and use it. It is important that it is easy to do the test correctly and hard to fail. We have tried to find a form that makes sense for the user. One of the early decisions was that the user should be directed to hold the device with the right hand, and take blood from the left hand. The design of the device should be good enough to require very little precision. Even if the user is left-handed it should not be crucial for precision to use the wrong hand. To make sure that our own interpretations of the form language were criticized we made continuous user tests to get feedback. 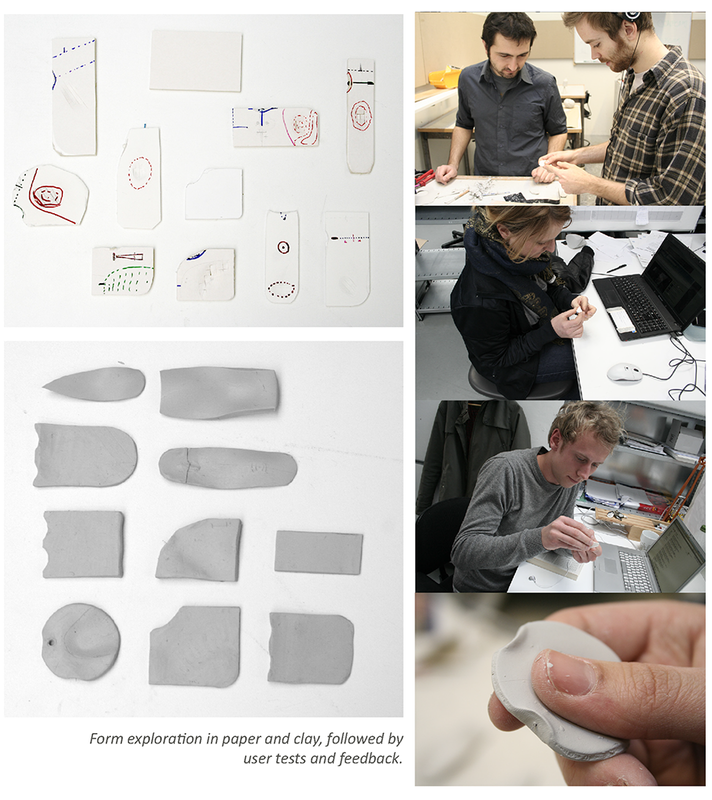 The users were evaluating everything from the overall form, to placement of needle, grip etc. For the users that was anxious about using needles it was important to feel that you are in control, with a steady hand and a clear sight of the needle. Because of this we wanted to find the best way to feel secure with the placement of fingers, the needle and the test strip. The prime concern for the overall package is the information and instructions. The message should be clear and understandable, offering essential information about diabetes and sufficient instructions for successful use of the device. We have tried different types of graphics for the test device, with continuous feedback from users, trying to find a layout that makes sense. In the beginning of the project we considered different biodegradable materials, and ways to recycle the separate parts of the device. Nevertheless, we considered that users might feel comfortable if they could throw the medical artifact in the regular bin, not having to separate the different parts, for example the metal needle. Keeping it conventional and easy to produce, we have chosen to use plastic for the test device. This material is most commonly used for this kind of products, as it is hygienic, associated with precision and safety, which might secure the user’s trust for the product. To increase the overall experience and the probability that the user does the test, we have considered a number of additional features for the test kit. Remembering to do the test in the morning before you eat is important for a successful test, and details that improves the hygiene makes the user feel more secure and comfortable. It is important that the user feels in control and that it is easy to be accurate and steady, while pricking the finger and applying the blood. It has been our main concern to make the user feel confidence when using the product. The shape offers a good pinch grip for the right hand, and the increased thickness close to the needle and test strip acts both as an illustration of the active area of the product, as well as an improved grip ability for higher precision. The test strip and the needle is protected from the outside by a plastic seal, that is torn off before use. The needle is of the same type as in regular blood glucose meters. It is long enough to prick most finger types, and the sharpness of it makes the sting feel very little. The test strip reacts to the amount of glucose in the blood drop, and emits a color from left to right to show if the amount of glucose is normal or high (above 126 mg/dl). Christian is at work, when his manager approaches him and encourages him to take a diabetes test with this kit. Back at home, Christian reads the instructions which tell him to do this test the following morning. He uses the reminder ring to remember to do the test before he eats breakfast. When he wakes up in the morning, Christian notices the ring and remembers his task. The instructions in the package tell him how to prepare and what to do. 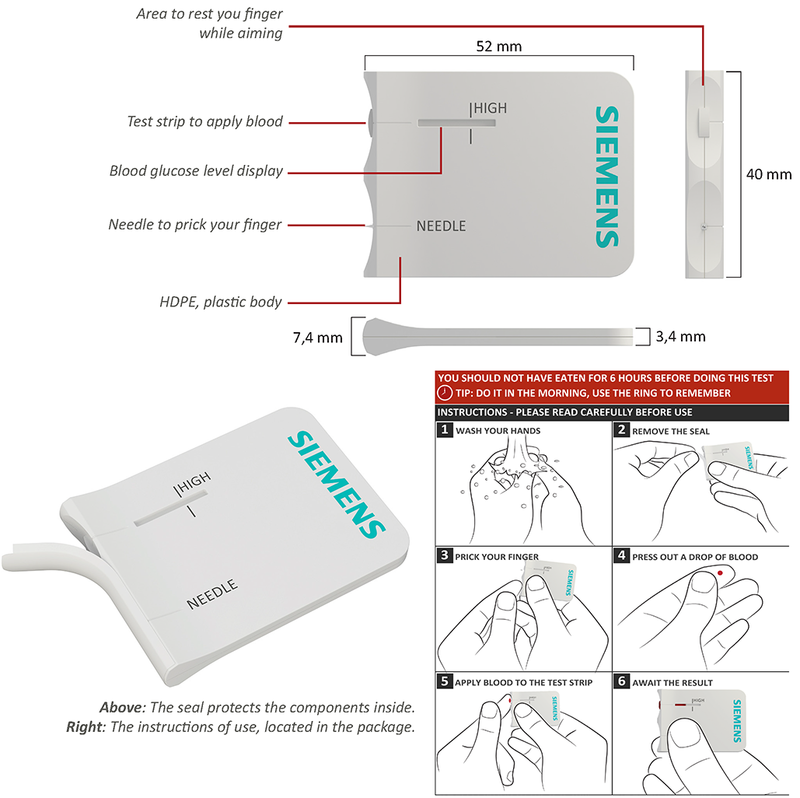 After Christian washed his hands, he uses the needle on the test device to prick his index finger. He presses out a drop of blood and applies it to the test strip. Christian is told that the amount of glucose is higher than normal. Reading the further information on the packaging gives him a number to call for making an appointment with a doctor, to perform a complete diabetes test. At the health clinic he found out that he had an early stage of type 2 diabetes. However, since he found out before it became serious; Christian can adjust his lifestyle to prevent the disease from increasing.